The Signature wooden roller coaster at Jazzland Theme Park in eastern New Orleans is reaching new heights. One of four roller coasters planned, the ride will travel at speeds up to 65 mph on 4,000 feet of track. Park officials will hold a ceremony today to announce a name for the ride and celebrate a construction milestone. Phil Clark, vice president and general manager of Jazzland, said the park is 60 percent complete. Developers expect to open Jazzland in the spring. The Space Shot/Turbo Drop ride, at right, features a 185-foot tower. 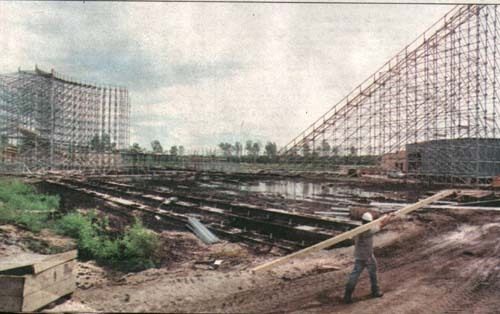 Ogden Entertainment, a subsidiary of Ogden Corp. of New York, is developing the park. Above, a worker totes a wooden beam to the construction site.